Most of us dread Mondays for the sole fact that it is the start of another work week, as if the weekend is a temporary escape from the reality that is life. On a Sunday night, I always get to read tweets or Facebook statuses that read: "Monday na naman bukas." in a tone that resonates defeat. Since we're night owls, the work week doesn't start until Monday night. 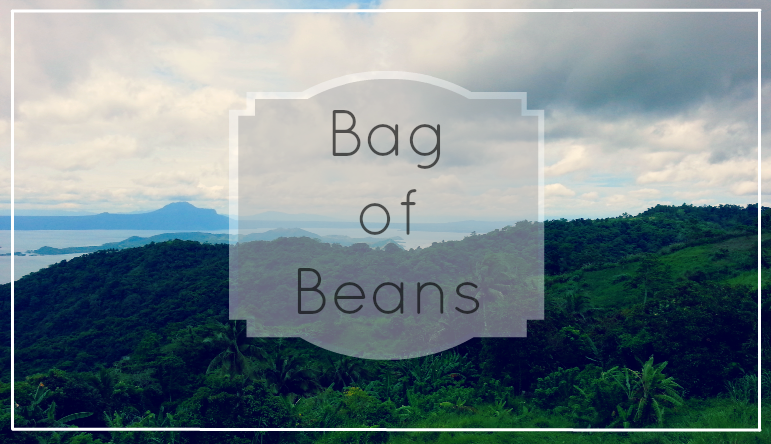 We thought of shaking things up on this certain Monday morning so we decided to have breakfast (turned brunch) at Bag of Beans in Olivarez in Tagaytay City. The first Bag of Beans branch is located in Mendez Crossing West, still in Tagaytay. 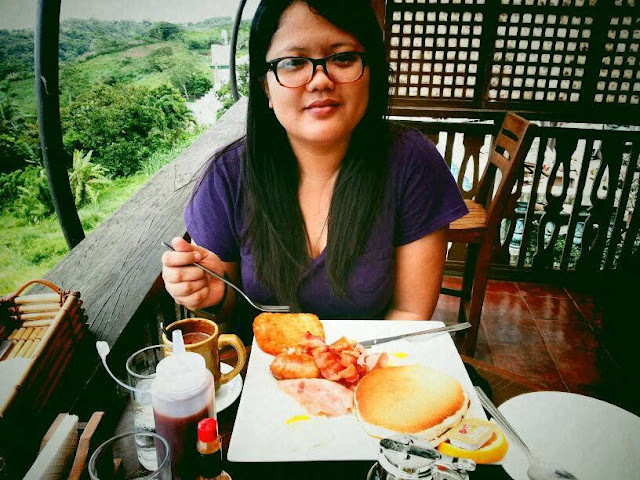 Since this would just be a quick brunch, we didn't want to go out of way so we just went to the more accessible branch, the one in Olivarez, which was around an hour away from Bacoor. There were no other customers when we got there so I had the opportunity to take lots of photos. 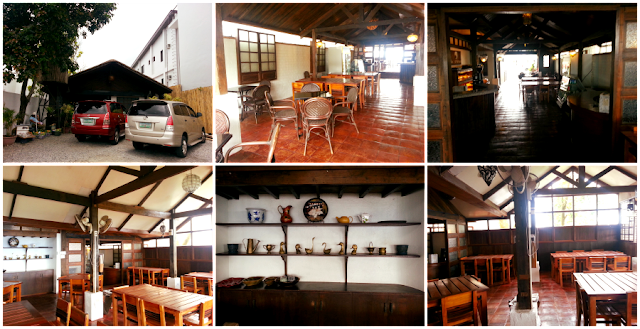 The interiors are very rustic, everything is made of wood as if it's a house that belongs to a craftsman. The cozy ambiance is just perfect with the cold morning weather. We were looking around and we spotted the balcony. The set-up was very intimate with tall chairs and tables overlooking a wide stretch of greens and blues. It was very uplifting and relaxing. The greatest view. How can you not fall in love with that? Okay. 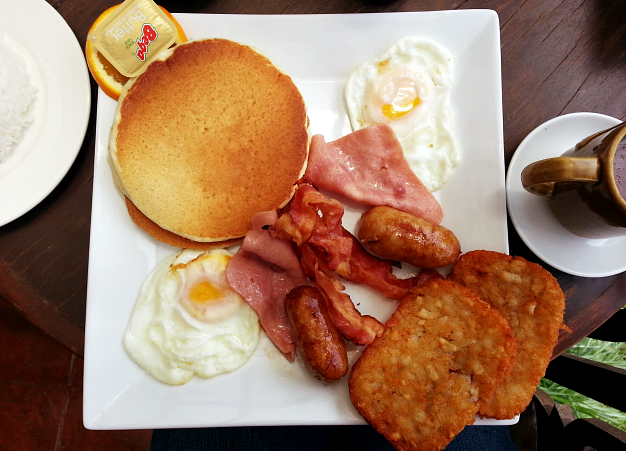 I should have had an inkling that, this being called the Breakfast Sampler, the serving would be huge. Should I have known, I wouldn't have ordered that extra cup of rice you see there. Hahaha. But then again, it's breakfast food so, challenge accepted! I loved everything on this plate! And you probably thought by now that I have the appetite of a growing teenage boy (well, uh, yes), right? Hahaha. There was really nothing extraordinary about the sampler since it's just the usual breakfast food you could cook in your own kitchen but I guess the cool and relaxing atmosphere made up for it! I still enjoyed this a lot. Comfort in a plate! We loved the hot chocolate because it was rich and intense in taste and thick. 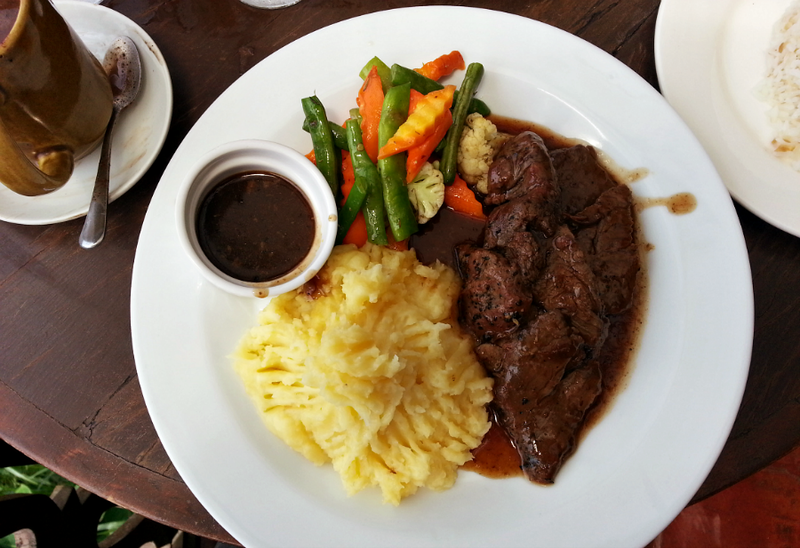 Something to keep us warm amid the wonderful cool breeze. I wonder if the one who made the mug is left handed though? With the amount of food that we ordered, it took us quite a while to finish as much as we can. 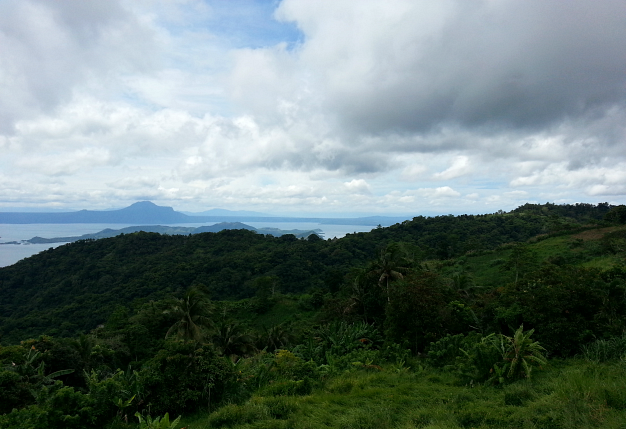 What made everything more enjoyable and memorable was the warmth of the place, the view and the cozy conversations. The food was really good and their customer service was great. 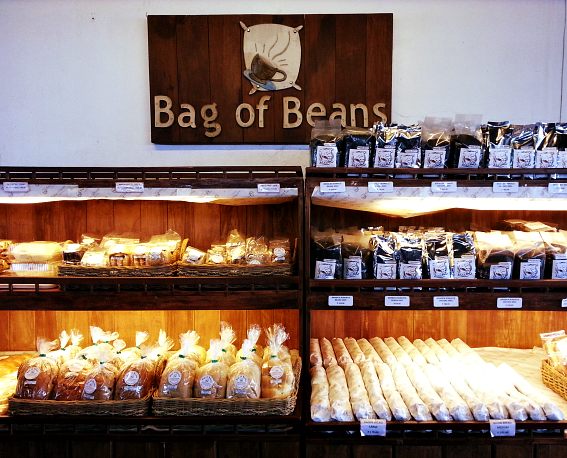 If you'll be around the Tagaytay area in the future, do try Bag of Beans out. 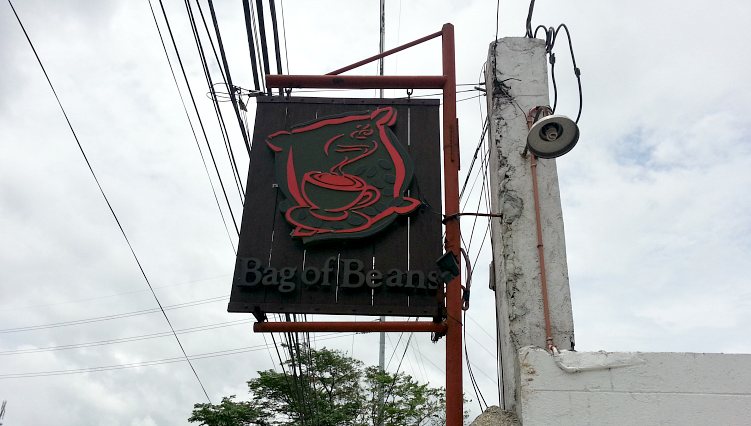 And if you like thrifted clothing, there's a huge thrift shop just across Bag of Beans. I haven't shopped there yet but I read online that they got really cool pieces. I've gone here like a month ago. The place is feels cozy even if it's really chilly at night. I loved their apple pie, it was especially served fresh. Too bad I wasn't able to experience the overlooking view because I've gone there for post-dinner bonding with my family so it was dark. Hahaha. It was a great experience, though. Perfect for the gloomy weather right now!